I am a former Special Education and middle school science teacher in San Antonio, TX. Most of my profits go toward donations to my school for special projects such as field trips or supplies and now for Project: BLOOM, a STEM scholarship for young junior and senior female high school students. I began beading necklaces a few years ago as a hobby which began as gifts for my bridesmaids. The educators at my school began asking for custom pieces and it evolved from there. I use natural beads and semi-precious stones such as turquoise, amethyst, agate and crystals. 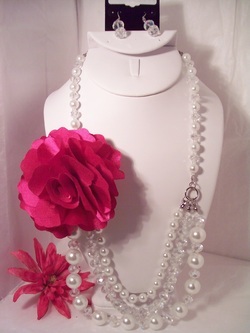 Most of my business comes from repeat clients who customize their jewelry to their specific tastes and needs. Call me or e-mail if you would like to schedule a show for your home or office in the immediate San Antonio-Austin area. Thank you so much for your valued time to look over the pieces on this website and I hope to meet you and make a custom piece for you sometime soon! !